It is the goal of NEWH to further our industry through scholarship and education. Our Vendor Scholarship Program allows those in our industry to give back and support our future Hospitality Leaders. scholarship to be given to a student pursuing a career affiliated with the Hospitality Industry in Interior Design. The scholarship opens in September with a December deadline date. The award will be presented at BD West in April 2015 at the San Diego Convention Center in San Diego, CA. The 2014 recipient was Melanie Murata a student at Florida State University. The very first Fabric Innovations Legacy Scholarship was given to Karen (Karahm) Paik, an undergraduate student at the Cornell School of Hotel Administration, majoring in Hospitality Management. In conjunction with working on her Bachelor’s Degree, she will also be receiving an Associate’s Degree from the Culinary Institute of America. This generous $10,000 scholarship was sponsored by Deborah Herman, owner of Fabric Innovations, at the Platinum Circle Awards in New York this past November 2013. Deborah is a long standing, beloved member of NEWH and serves as International Ambassador on the International Board of Directors. She also received the NEWH Recognition of Excellence Award several years ago and has dedicated over 20 years to promoting and mentoring students and young women in the Hospitality Industry. 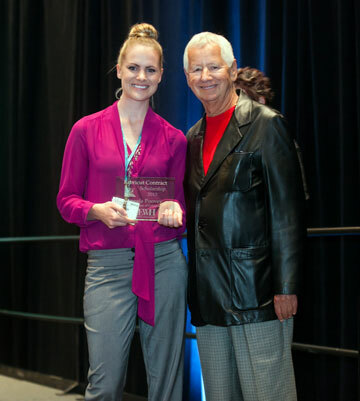 The second Fabric Innovations Legacy Scholarship will once again be awarded to a deserving student at the 2014 Platinum Circle Awards. NEWH, Inc is pleased to be able welcome Symmons Industries to our Vendor Scholarship family with a new $4,000 scholarship award for Interior Design and Architecture students. The award, which will be presented to a winning student each May at HD Expo, will include a design component starting in 2015. In 2014, Symmons made a 3-year commitment to supporting students with this scholarship and we are very grateful for their support. Headquartered in Braintree, Massachusetts, Symmons is a proud US-based manufacturer and employs nearly 300 people. Symmons kitchen and bath products are distributed across the globe.